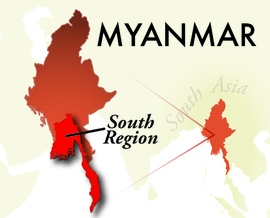 Located primarily in the fertile plains of the country, the South Myanmar Region is home to many different people groups. Most villagers are devout Buddhists, and the area contains an ornate temple with the second-largest Buddha statue in the world. The country’s most populous city and traditional capital, Yangon, is also located in this region, though the government technically moved the administrative capital to Naypyitaw in 2006. Many of the people in this region work as fishermen, farmers and ranchers. Some also produce rubber, palm oil and other goods.